What is the difference between a microchip and Gibi? The microchip is a passive device that requires a) someone to find your pet, b) someone to take your pet to a place with a microchip scanner, and c) your programmed contact information be kept current. Chips do not help you find your pet. Chips help the person that finds your pet find you. Gibi, on the other hand, puts the power in your hands to find your pet with a click of a button. 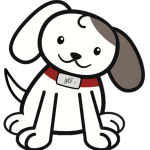 Gibi also notifies you via text and email that your pet is not in their designated safe zone and allows you to actively find your pet. No waiting, no worrying, no posting of lost dog signs with Gibi. Gibi provides a 90-day limited warranty. Gibi warrants the included hardware product and accessories against defects in materials and workmanship for 90 days from the date of original retail purchase. Gibi does not warrant against normal wear and tear, nor damage caused by accident or abuse. If you purchased your Gibi used from the Gibi Online Store, the warranty is reduced to 15 days from the date of original retail purchase. If you purchased your Gibi used from other than the Gibi Online Store, the warranty is void. Click here for more information. Can I rent a Gibi? You can rent a Gibi. For more info, email woofwoof@gibitechnologies.com. I would like to be a Gibi reseller. Who do I contact? To become a Gibi reseller, please email us at woofwoof@gibitechnologies.com. Please include a copy of your reseller’s permit. I am a veterinarian. Do I get a special price? Please email us at woofwoof@gibitechnologies.com.